A bottle of pure honey contains the natural sweet substance produced by honey bees from the nectar of plants or secretions of living parts of plants. Nothing else. When scientists begin to look for all of the elements found in this wonderful product of nature, they find a complex of naturally flavored sugars as well as trace enzymes, minerals, vitamins, and amino acids. Comb Honey - Comb honey is honey in its original form; that is, honey inside of the honeycomb. The beeswax comb is edible! Whipped (or Cremed) Honey - While all honey will crystallize in time, whipped honey (also known as cremed honey) is brought to market in a crystallized state. The crystallization is controlled so that, at room temperature, the honey can be spread like butter or jelly. In many countries around the world, whipped honey is preferred to the liquid form especially at breakfast time. Honey is normally bought and sold in one of two ways: by variety or by color. Most consumers, whether buying honey in a supermarket, at a farmer’s market, or directly from a beekeeper, will typically buy either a blend of pure honeys, the supermarket store brands or a particular honey varietal, such as the most common of all the varietals, clover honey. The color and flavor of many honeys are linked; that is, the darker the honey, the more apt it is to taste stronger and more robust. The lighter colored honeys are usually more delicate and sweeter in flavor. Sometimes people shop for a honey varietal simply because they like the flavor or it reminds them of the kind of honey they had when growing up or they like to impress their friends with a unique treasure. Overall, these customers like the delicious flavors of honey; the color is irrelevant to them. 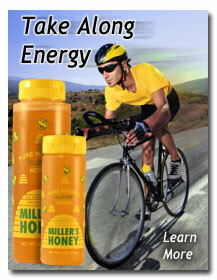 However, industrial users such as bakers, food processors, and beverage makers, will often buy honey by color. Industrial users are typically driven by ingredient cost. The industrial users will often contact a major honey packer (bottler) and buy in large totes or 55 gallon drums. While they want pure honey in the formulas, of course, they want the honey as an ingredient more for labeling purposes than for variety. In addition, the functional aspects of the honey, for example, as an ingredient used in baking, doesn’t much change if the honey is light or dark. Honey is hygroscopic and attracts moisture to the bread or dessert – a very valuable trait in baking. Generally speaking a very light colored honey is much more expensive than a dark honey. The baking company may specify a darker color grade such as amber honey, rather than a lighter colored honey such as a water-white honey. A question that is often asked is how industrial grade honey is “made.” Most people understand how bees will visit a particular field of flowers to get a certain variety, for example, sage honey, but they can’t quite understand how an Extra Light Amber color of honey is found. Actually, the answer is rather simple. Many commercial beekeepers, rather than keeping track of to what flowers their bees might go, are simply content to collect whatever honey the bees bring in at the end of a season. It’s a little more scientific than that, of course, but at the end of the season or month, or whatever the time period, the honey is collected and graded by color. There are more than 300 varieties of honey found in the United States. However, only a small percentage of those honeys are popular. It sometimes takes more of an effort to market a particular variety, for example, Huajillo or Sunflower, than to simply collect those honeys and grade them into amber and extra light amber honey for industrial usage.